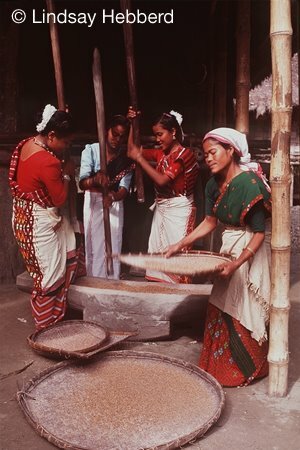 Mishing tribe constitute 17.8 % of Assam’s population. Mishing speaking population is 88% and their literacy rate is 60.1% (census 2001). Original home of the Mishings is said to be in Arunachal Pradesh from where they have migrated to plains of Assam centuries ago. Therefore, Mishings are found in both in Assam and Arunachal Pradesh. They are a part of Tibeto- Burman family of Mongoloid race. Unlike other Tibeto- Burman languages, Mishings have no scripts of their own. But Mishings realised down the ages print literature has been acknowledged as a part of the literary canon and has alone been considered as proper literature. Oral literature debased and gradually erased from the face of the earth in the course of time and along with it put an end to a culture. In order to save the culture they must convert their dialect into literature. This farsighted nature of Mishings gave birth to find a script to popularise and flourish their language. In early endeavour Assamese script was used as the Mishing script. The pioneer in this field being Sonaram Payeng, who added two more sound symbols and initiated the first step in popularisation and preservance of Mishing language. His book “ Miri Doban”, 1915 is the first book on Mishings in Assamese script. Other noteworthy writers like Dr Nomal Chandra Pegu presented another book in 1956 titled “Mishing Abig” followed by “Mishing Path” by Kamal Chandra Padun in 1958 and “Mishing Agom” by Bibhishan Pegu in 1963. Earlier in 1886, J.F. Needham had written a grammar in Roman Script under the title “Outline grammar of the Shaiyang Miri Language” which most probably encouraged the scholars to adopt Roman script for the development of Mishing language and literature. Finally in 1972, in the Mishing Agom Kebang, the highest literary body of Mishings, the resolution was unanimously passed to adopt Roman script in Dishangmukh, Shibsagar district of Assam on 18th April. Since then Mishing language has crossed many milestones in the field of literature in Roman Script. Languages and dialects are dying daily, mainly due to lack of initiative by its speaking population. Mishings in this regard are very careful in guarding the growth of their language. Periodicals, news paper, books, dictionaries etc have come up in many numbers and still growing. This is a sign of Mishing effort to nourish and establish their language at par with that of other standard languages because they understand that culture lives through language. Death of a language means death of a culture. Despite of a self identity established by the Mishing language, the growth is somewhat rather slow. The reasons are many. Let’s count a few of them. a) Urbanisation / migration : The people when go out of their own community and live in a different language setting, new born babies are less impacted to their mother tongue. When parental influence towards their own language becomes passive, the child instead of learning his mother tongue starts liking the language spoken by the majority where he lives. Assamese, Hindi being the dominant languages and widely spoken, Mishing children, living in urban settings are not only ignorant about their culture but also ignore their mother tongue. b) Parental: In modern settings parents are less worried if their child knows Mishing. They are worried whether their child speaks Hindi and English fluently. As a result they also encourage their child to become more conversant in Hindi or English than Mishing. c) Education: Assamese, Hindi and English are the languages of text books in school. It is expected that the child should master these languages. There are no text books in Mishing and Mishing is not taught as a major subject in schools as a result child becomes less inclined to learn the language. In the formative years a child is forced to learn other languages on priority as a result mother tongue is ignored. d) Government policy: Government policies are not language friendly. Very little is done from government side to support and sustain the language. Neither any periodicals in mishing language are published by the government nor support any regular publication to keep this language alive. I have seen many periodicals with beautiful dreams to preserve Mishing culture but meet untimely death due to lack of support. For Example “Promising Action”, a beautiful periodical used to be published regularly but now a days it is not. e) Community/speaking population: Survival of the language comes from its own community/people. They need to be literate and make effort to keep it alive. Educated and elite class should contribute for the development of the language which is not so encouraging in case of Mishings. Well to do people should come forward for popularisation, funding research projects and publication of books. f) Others: At the same time scholars from other languages should guide, translate and help its development. Awards may be instituted for popularising Mishing literature For Mishings and non Mishing writers. A healthy attitude towards this language by other will certainly add dimensions to its growth. The Journey starting from 1915 with MIRI DOBAN till today almost touching a century has never been a smoother one. In between several setbacks and hurdles, Mishing language is prospering and able to establish itself as a language in the north east region. For this credit must go to its people who despite of all odds have been trying to keep it growing.